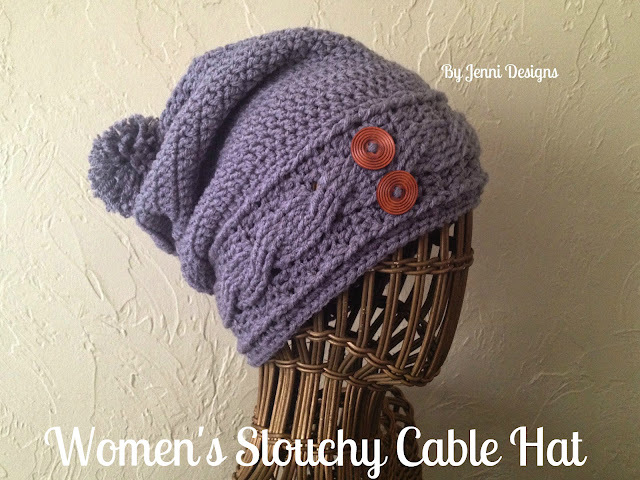 This design is a spin on my Cable Ear Warmer pattern, if you have already used my ear warmer pattern this will be a piece of cake for you. The base of the hat is the ear warmer and the rest of the hat is worked from the edge of the ear warmer. If you have a hard time with the ear warmer portion of the pattern you can click above to be taken to the pattern where there is a video & photo tutorial. Red Heart With Love Yarn, approx. 225-250 yrds. Continue to repeat from **to** for a total of 48 rows. After row 48, hold together ends and sl st together. Make sure you are slip stitching along the wrong side so this isn't on the outside of your finished hat. Ch 1, work 2 sc over each dc and 1 sc over each ch 2. You should have 72 sc total. Join. Ch 1, sc in same and in each around. Join and fasten off. Ch 1, work 2 sc over each dc and 1 sc over each ch 2. You should have 72 sc total, join. Do NOT fasten off, continue on below. -Joins are made with sl st to the first dc NOT the ch 2. Your hat should currently be right side out. If you are adding a pom-pom you can either sl st the opening shut or fasten off leaving a long end to sew the hole shut, making sure to sl st/sew through all the open stitches. If you are not adding a pom-pom, turn hat wrong side out and fasten off leaving a long enough end to sew the hole shut, making sure to sew through all the open stitches. Sew in ends. Add pom-pom (below is how I make mine) and/or buttons, if desired. You can also leave off the buttons and pom-pom and you still have a great slouchy hat! I LOVE this! Going yarn shopping tomorrow! I love this hat and going to try and make it. I'm wondering if you have a video tutorial as I have a hard time reading patterns. Hi Arlean, I do not have a video tutorial yet but I will soon. I'm new to crocheting. What should I do if I need a hat with a bigger head circumference or if my hook size is not the same? 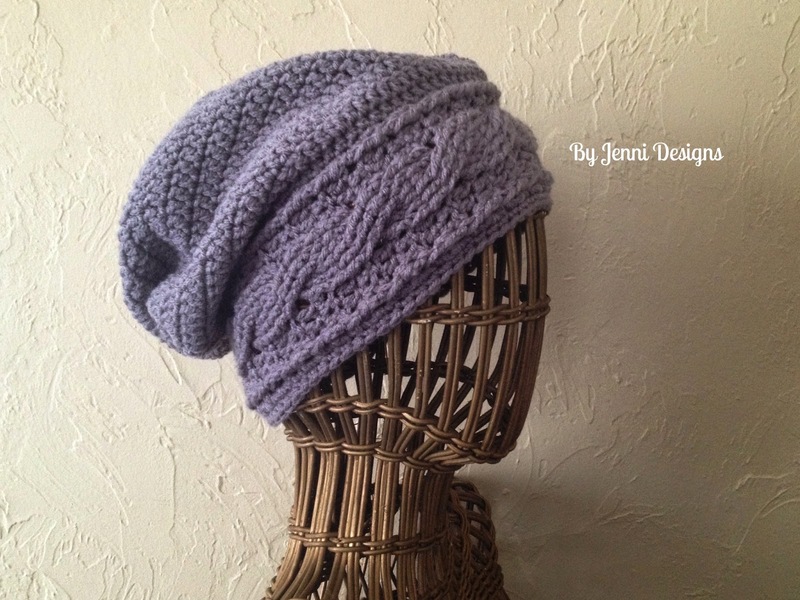 This hat starts out with a headband pattern as the base that is easily adjustable, when you are getting towards the end of the headband portion you can add additional rows there. You could try this pattern with a different hook size but it will change the size depending if your hook size is larger or smaller. Would your owl buttons on etsy work with this pattern? The owl buttons currently listed may be a tad big, they are 5mm larger than the buttons shown in the photo. How much yarn is needed if making this without the pompom? I have exactly 250yd that I would like to use for this but want to make sure I have enough before beginning. Thanks! Hi Sarah, I received your message on Ravelry and sent over a reply there. If you are using Red Heart With Love and getting gauge then 250 yards should be perfect.